Hallo everyone. I'm a bit behind with posting this time, because I was out of I-Net for almost two days. What a horrible experience. It seems as if I'm addicted and I can't be without my computer, not even for a day. But now I'm back - I just hope it will stay this way - not so sure about my old modem and the connection. But now, back to 'Samantha' - I will come back to all your wonderful comments soon, but first let me post the next chapter. He had used the need for a bathroom break as an excuse to escape Mr. Connor. Now he was sitting on the edge of the tub, trying hard to sort out his feelings. The whole world seemed to be turned around. As much as he tried to ignore it, to know about his daughter had changed him. Mr. Connor was right, he cared for her ... more than he wanted to care. It made him much too vulnerable and sensitive. "Don't be so hard to yourself. I guess, you care more for her than you think you do." This had been like a shock. What did he know? How did he know? He almost overheard the knock at the bathroom door. Casey. Zeke smiled. This was the best of all, of course. Casey loved him. Casey would always be with him ... forever. Whatever this was supposed to mean. Forever. He didn't know, how long 'forever' would be, he didn't want to know. With Casey by his side he was stronger than ever before. He unlocked the door and Casey pulled him into his arms and kissed him. Long and soft, he didn't care any longer that he was 'back home' where only short, quick embraces, secret, brief kisses were possible. "I've told you," murmured Casey. "I knew, I could count on him. He's my dad!" "You should apologize, Case, what you did was harsh. He would never hurt you deliberately, you know that." "No excuse though," Casey muttered. "It was low what he said. But don't worry, we can't be mad on each other for long." He bent forward to kiss him again. Zeke looked apologizing at Mrs. Connor while Casey refused to let him go. "We will go upstairs into my room," he said. "Zeke looks worn out, I guess he needs to rest after all this." "Mhm. Be nice, boys, okay?" Casey giggled and pulled Zeke to the stairs. When they entered his room Zeke stopped dumbfound and stared at the ... thing in front of Casey's bed which used up most of the free space. "I've told them that I'm not gonna leave you alone tonight." "My mom was all: 'Oh no, Casey, you can't share a bed. It's much too small for you two and Zeke needs a lot of room for his broken arm.' Suddenly my dad came up with his old air bed. Think he tries to make up for something?" The next days were long and hard. Zeke was not used to it to leave it to others to solve his problems. But he had promised it. "Zeke," Mr Connor had said when they were ready to get into the bus which would bring them back to Columbus. "Be nice, okay? Concentrate on College, have fun with friends and calm down a bit. No more trips to Indiana. And don't try to contact the Dickensons in which way ever. Will you promise me that?" He had shrugged and answered: "Yeah, sure." But now he was not convinced if he could endure it any longer. He hated to be forced to inaction, felt jumpy and nervous. There was not much that could distract him. College was slow in the moment with only a few weeks to summer break. And Casey didn't want to stop to make future plans. As much as he loved him for that ... sometimes he was ready to yell to make him stop. Finally he had agreed to watch at least the video Kat had send him. 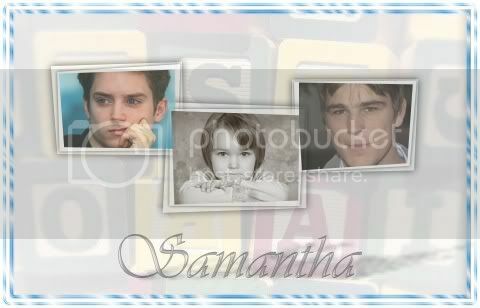 As expected it mainly was about Samantha, though it had given him a twinge of pain first to see Kat on the screen too. The video had obviously been made when she already was sick - she looked pale and so small and her voice was low when she started to talk. "I've asked one of the guys from the hospital for help to put this video together. It's about time that you get to know more about your daughter. I'm so sorry, Zeke, I should have told you earlier. You have a right to know. I just hope you can forgive me." Zeke squeezed his eyes shut, a serious accusation would have been easier to endure. "She's amazing. I'm sure, you would like her," Kat went on. First there had been some photos, old ones, black and white and a bit blurred on the screen. Samantha as a newborn baby. Her pacifier looked almost bigger then she was. Some dark hair, her eyes wide open. Another one - Kat in a hospitals bed, the little baby in her arms. She looked exhausted but happy. "This was the moment I realized that I will never be alone again." Her voice sounded stronger now and Zeke knew that she had smiled. "All the months before it had felt like a bad dream. But then ... she changed everything. When I saw her smiling ... she always smiles, you know, even as a baby she's rarely cried ... I felt like the luckiest girl of the world." Then a few video sequences. A birthday. Three candles on a cake and a little girl with wildly opened eyes - brown with a touch of green - Kat's eyes. Christmas. A little sparkling tree, stockings at the fireplace, small presents, lovingly wrapped. Summer holiday. Together with Kat again, at a little lake. She held her safe in her arms while the baby splashed around in the water with her feet, cheering with joy. Samantha, a bit older now, in a zoo, together with an elderly couple this time. They all were laughing while the man helped her onto a Pony. The Quest's, Zeke guessed, the owner of the little hotel who had given Kat not only a job but a home. Who had cared for her, more than her parents ever did. And it was obvious that they had loved Samantha too. In a way it was reassuring to see this. Even if he had abandoned them, at least they hadn't been alone. I'm glad Mr. C came around a bit. It's good that Zeke finally watched the video; I'm looking forward to when he finally meets his daughter. I guess it's important for Zeke to get to know more about his daughter. Only then he will be able to make the right desicions without regretting anything later. What a heartrending chapter this was but with some light shown at the end of the tunnel. Sam at least knew love when she was with her mother. It is hard for Zeke to accept that his daughter means a lot to him because it makes it even more difficult to make the right decisions. But I think it's necessary that he gets to know her better because only then he will be able to make desicions he will not regret later. Hi Mews, so good to see you here :) I'm glad that you like this chapter. Yes, the boys belong together and even Mr. Connor starts to accept that Zeke might be not as shallow as he thought he is. Hopefully he will be able to help them. I'm glad Zeke is getting to know his daughter. How thoughtful and smart of Kat to put this together. She has reached out to Zeke in the hope that he will be strong for this little person who needs him now. Samantha has known some happiness and maybe things are not as bad as they seemed before. But there is still a lot to be settled. Zeke needs to prepare himself for stepping up to this responsibility. And Casey is doing all he can to make him feel supported and cherished. Zeke daring to catch up on the past, through that video tape, is heartbreakingly cute. Leaves me to hope that some time soon, when he finally meets her, talks to her, hugs her sweetly, he will find as much of a home in her than she must be finding in him. Ah, through Zeke's angstiness, he forgets... he's not the only father in the world. ;) I hope things can get rolling now!